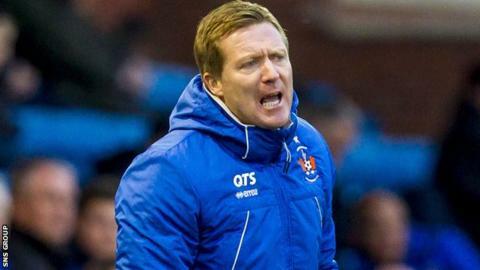 Former manager Gary Locke is sure Kilmarnock can move away from the bottom end of the Scottish Premiership. Locke resigned on 30 January following a 1-0 home defeat to Hamilton, with the Ayrshire club occupying the relegation play-off place. But Locke is proud of the work he did developing young players and believes the team can salvage their season. "I'm more than confident that the squad of players they have is good enough to get them out of trouble," he said. "Looking at the league table, it's very tight. If the club get a couple of wins then they can get themselves up the league. "I'm hopeful that they can kick on and finish well." Following a spell as assistant to Allan Johnston, Locke, 40, was put in temporary charge in February 2015 and signed a three-year contract in April. He won 11 of his 43 games in charge. "It was a big decision," he said of his resignation on BBC Radio Scotland's Sportsound. "I just felt that, for me, it was the right thing to do. "It was frustrating. You'd go and get a great result at Parkhead and then the following week you'd lose four or five goals. "It went from one extreme to another and, as the manager, you've got to take responsibility for that. "Looking back, you'd maybe do one or two things differently. "Certainly, off the pitch, a lot of things people don't see, needed to be improved. "They didn't have any sport scientist or a gym at the stadium and I thought that was important, certainly for the younger players. "One positive I can take from my time there is that I put a lot of young players into the team and a lot of them have done well. "I could have maybe brought in a couple more players rather than helping the club off the pitch. "But I thought it was only right to address those issues and those young players are fitter and stronger than they were this time last year." Locke spent the last seven years of his playing career at Kilmarnock, leaving in 2009, and notices a big difference in the financial climate. "When I played, Kilmarnock spent a lot of money and we regularly finished in the top six," he said. "The board were great to me and they want what's best for the club but they simply don't have the money that they used to have. "I think maybe expectation levels need to be looked at. "But, with the players they've got, they should be in a position to challenge for the top six and if you look at the table they can still do that."